Although I’ve visited Hong Kong numerous times through the years, I have rarely set foot on one of their many islands. Both because I’m not a huge fan of boat as a mode of transport, and also because the one time I do remember visiting an island (Lamma island), it consisted of countless hours of tiresome walking up and down hills. I wasn’t really too keen on visiting another island until a couple of TV shows and stories from relatives who visited convinced us that there was plenty of good food and fun to be had at Cheung Chau, so we decided to make a day trip of it! It always amazes me how convenient transport in HK is. Getting to Cheung Chau is simple- take a train ride to Central, short walk to the pier and then a half to an hour’s ferry ride depending on which type you catch. The total trip takes less than the time it takes for me to get to uni, and costs around half as much as well. Oh Sydney transport…how I dislike you! The difference between the city and the islands is quite noticeable from the moment you leave the pier. It’s a much more relaxed atmosphere, much less noise and much less crowds. Unfortunately, I can’t say that the locals are too friendly, with an old lady screaming at us to move out of her way (who, might I add, was actually some 50m away from us) when we stopped to take a picture and the constant speeding of small trucks through the shared road without much warning than a hostile beep when you got too close. The shopkeepers were much more pleasant though! First things first- we needed breakfast! Although the main road was filled with plenty of dining options, there was nothing we really felt like having for breakfast, so we wandered off to alley behind, running parallel to the main road which had a surprisingly large number of interesting options. We stopped by this old-style restaurant for some yum-cha, and were disappointed to find that it was packed, but luckily, there was additional seating in the adjacent cafe, which was run by the same owners. Service is minimal, as there is no ordering of food- you simply hop out the front where all the steamers are, choose everything that you want, then the lady will stamp it off and you can bring your food back to your table. We were really surprised at the quality of the food here- it may not look it, but we unanimously agreed that this was definitely one of the best yum-cha’s we have ever had. The sui mai, one of our yum cha favourites was perfect- the right about of bounce, not too soft and not too dense. As they didn’t have har gow, we chose the chive dumplings instead, which were also quite enjoyable- generously sized dumplings with a soft, bouncy skin. Instead of the classic steamed chicken feet, there are steamed duck claws here, which is great since I like them better anyway 🙂 They’re longer, bonier and have skin that’s not so soft and loose in comparison to chicken feet, and are cooked in a deep, flavoursome lu shui (鹵水)-like sauce. Although I’ve had many versions of these steamed meat balls in Sydney, none have been quite like these ones, with an bouncy texture, whilst retaining the slight chew of meat as well as the taste. In addition to the yum cha classics, they also offer some old-school yum cha dishes which don’t seem to be around much nowadays. These are what I like to call the ‘reverse’ sui mai- a small ball of glutinous fried rice, covered in the sui mai wrapping. Sort of like bite sized Lo mai gai (糯米雞). 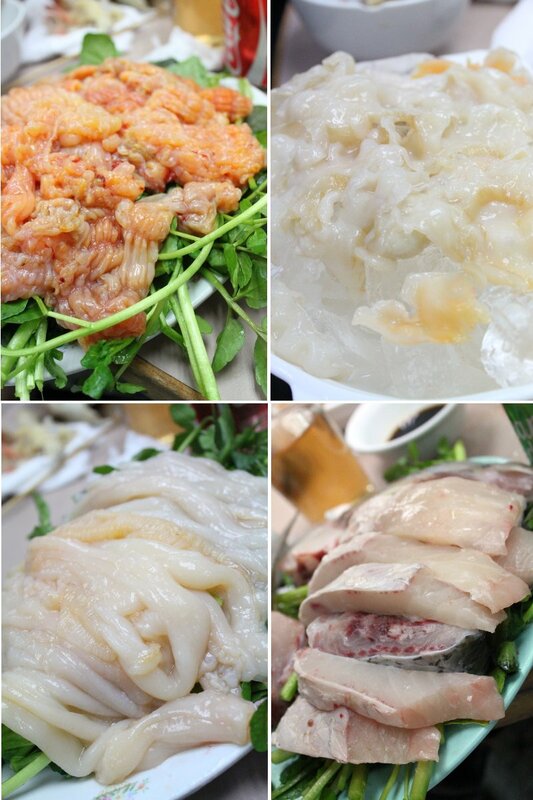 If you’re a fan of offal, then you must try the steamed tofu skin with pig stomach. I’m a huge fan of both tofu skin and pig stomach so it was no surprise I loved this- the combination of the too goes surprisingly well together! After this satisfying breakfast, we headed off to find more food (and things to see), making a mental note that we’d come back next time we’re in HK, even if it were only for the yum cha! keep walk and eventually you should be able to find it! We trekked a bit towards the Cheung Po Tsai Cave (one of the main attractions there), but decided against it when we got lost, realised that it was a long walk away, and although reception was good, both maps on iPhone and Android were nothing like what the roads were actually like there. We strolled around the main tourist area, and stumbled upon these homemade red bean pudding cakes (砵仔糕) by a friendly old man sitting by the waterside. Unfortunately, they weren’t as good as I had hoped, but it was still nice, especially since I hadn’t had some for quite a while! We saw racks and racks of neatly lined seafood drying in the sun (I’m guessing the island gets quite a lot of sunshine compared to city! )- not sure if it would pass Aussie food safety standards though haha. There’s plenty of old-school things to be found on this island. These huge tins of cookies were apparently quite common when my parents were young. The beach isn’t a long walk away, and isn’t too busy, although it’s quite small and the water is all littered up. Not sure I’d want to swim in there, though I’d assume it’d be cleaner in summer when there are more people and people actually bother cleaning up. On the walk back, there’s a couple of small stores and snack stalls. These japanese style red bean cakes at Hometown members club (which I later learn are quite well known) look quite interesting, though they weren’t as soft and as I’d hoped, probably because they weren’t very fresh (it seemed like a slow business day). And of course we couldn’t come to Chaung Chau without trying their famed mega fish balls. You probably can’t tell from the picture, but they’re pretty big- the size of golf balls. We’d had them before, when someone brought them back from a trip to Cheung Chau, but fresh is so much better! They are nice and tasty, though not quite worth the hype they create. Mega sized fish balls aren’t particularly hard to find in Cheung Chau- they’re everywhere! Definitely give it a go if you’re on the island! There’s plenty of fish ball places around the Island. This one is easiest to find because of its central location and huge signs/posters with celebrities on them. It’s called Welcome Food Court (時來食坊_ and located on G/F, 150 San Hing Back Street, Cheung Chau 長洲新興後街150號地下 and definitely hard to miss. We thought we’d have lunch before heading back home, so we walked around again looking for a place to eat. We see this cute little police car parked in the middle of the road- the local policemen are having their lunch break too, and we figured since they probably know the area best, we couldn’t go wrong trying the restaurant they chose too! It’s a small HK style cafe with your typical menu items, and we’re lucky enough to step in just before afternoon tea, so we’re able to choose something light from the afternoon tea menu (we were still pretty full from breakfast!). The stir fried noodles are good, with a good breath of wok, and strong taste, though it’s nothing amazing. I quite enjoyed the burger, with the soft fluffy white bun, crunch fried chicken fillet and plenty of mayonnaise. Be prepared to make a mess! 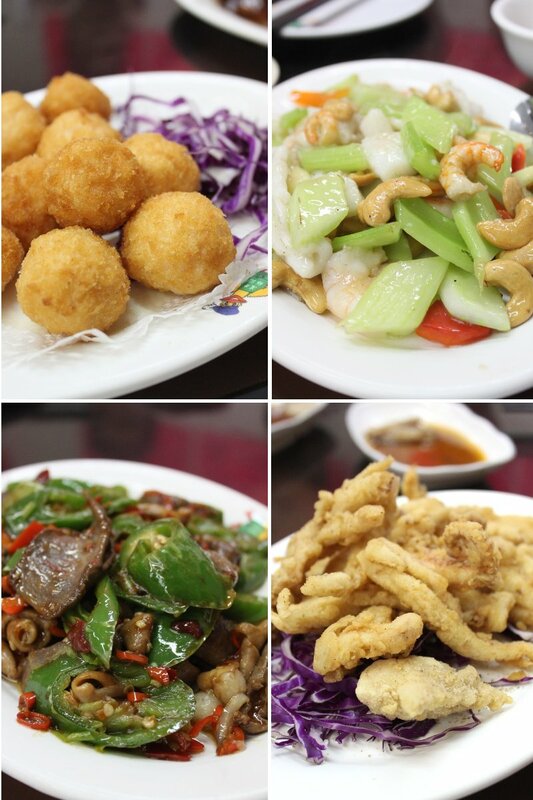 The restaurant is called 為食堡 and is located on G/F., 10 Kin San Lane, Cheung Chau 長洲建新里10號海景樓B座地下. Turn right along the main street and keep walking down til you get to the intersection at the end. And just when we thought we couldn’t fit any more into our stomachs, we came across this bakery selling egg tarts, coconut tarts and other snacks. How cute are these individual new year cakes! I love how everything is organised into beautiful neat rows. We couldn’t choose everything so we ended up only getting coconut tarts and egg tarts which were just as delicious as they looked! Eat there on the spot if you have the stomach space or buy some to take home! Definitely try this if you’d like to try some HK style baked foods (they also do the Cheung Chau buns during festival season). The bakery is called 康蘭餅店 (no English name) and is located on 91 Praya St, Cheung Chau 長洲海傍道91號B地下. From the pier, turn right along the main road and walk for around 2 minutes until you see trays of baked goodies! I’d been seeing these chip on a stick things all around the island since morning so I decided to grab one before I left. Yes, I know you can get them in Sydney too, but here, you can add your own flavouring onto your chip!. I sprinkled a bit of everything on, but my favourite was the seaweed flavour! There’s plenty more snack stores on the way, selling all sorts of things from waffles to shaved ice. As much as we’re tempted to try those as well, we couldn’t really fit much more into our stomachs. Oh well. There’s always next time! How late is too late to blog about something? I usually keep my posts up to 6 months before deleting them, but this post has been sitting in my drafts folder for almost a year, easily setting the record for the longest post in the draft folder. On various occasions I’d considered deleting it, reasoning that it’s only about the food on my previous Hong Kong holiday- places that I’d no doubt visit again and could write about later. Well, I’m almost off on another trip back, and I couldn’t bear deleting these photos and text, so I thought it’d be good to get this posted before I have more holiday eats to write about! My mum has wanted to take us to Yue Kee for a while, after tasting the roasted goose there a couple of years ago which she describes as pretty amazing! It’s located in Sham Tseng, an area well known for its roast goose/geese, and I’m told that almost every roast duck restaurant here does a great roast duck. My dad tells me of how he used to come to this restaurant after bush walking in the surrounding area…which goes to show how old this restaurant is! I don’t think I’ve ever had roasted goose in Sydney but to be honest, I can’t really tell the difference between duck and goose. I’ve been told by roasted goose lovers that goose has more of a depth of flavour (or something along those lines), duck lovers tell me that duck has more tender and succulent meat, but the only difference I can really tell is that goose is usually bigger and meatier. But I think the one best things about this roasted goose is the super tasty and crispy skin! The skin is definitely one of the crispiest I’ve had on roast duck/goose, but not dry like the skin of fried duck. My mum didn’t think this one was as good as the one she remembered eating last time but I still thought it was pretty good! Of course, being a duck restaurant, they also serve up pretty tasty dishes of duck innards! I don’t think I’ve had goose liver before, but it tasted rather much like pork liver. Duck/Goose tongue is another favourite of ours- I especially love the texture of duck tongue as it’s quite soft and a bit like eating chicken/duck skin, only much smoother! The goose tongue here does not dissappoint, served in an incredibly addictive and tasty ‘lo sui’ sauce. 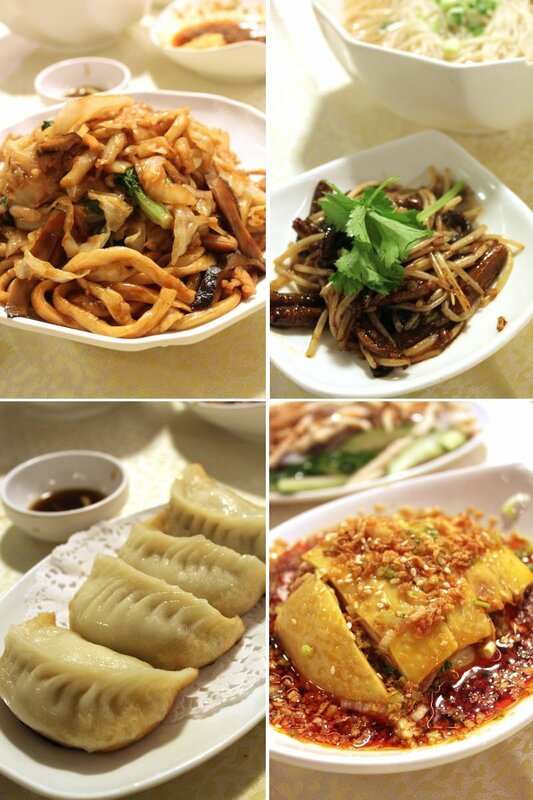 Their menu also offers a large selection of other dishes (at very reasonable prices too! ), and we find them all to be really good, and to some extent, even better than the duck. The deep fried prawn balls had an incredibly bouncy texture and were definitely on of the favorites of the night. Hot-Pot Restaurant with no English name…. We rarely have hot pot at restaurant in Australia, both because it’s much more expensive than we think it’s worth and the selection of food is quite similar to what we can do at home, but I don’t think we’ve had a visit to Hong Kong where we didn’t have hot-pot! 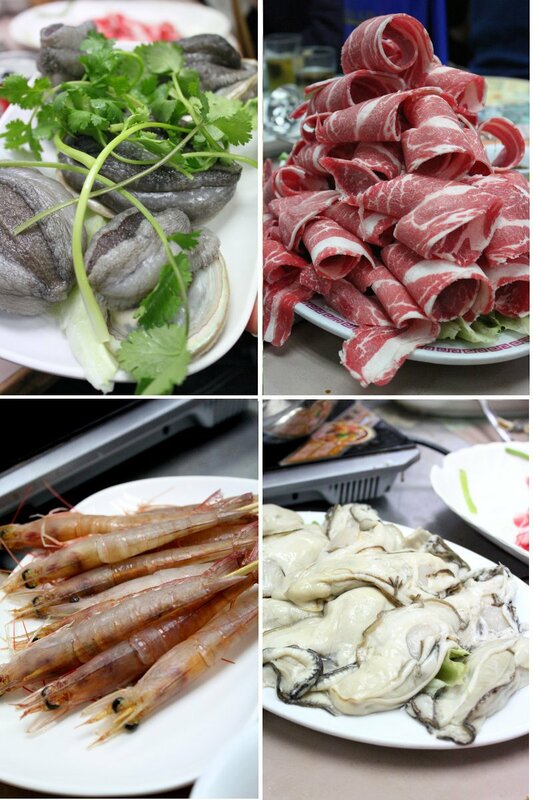 With many Chinese restaurants offering heavily discounted prices after 8:30 or 9:00pm (often half price), and some of the freshest and tastiest meat and seafood we’ve had, a great hot-pot dinner only sets us back around $10-$15 AUD per person. We’re invited to this hot-pot restaurant for my cousin’s birthday, and we can quickly tell that this restaurant is quite special, after searching around for it’s (almost literally ) hole in the wall entrance. The restaurant looks more like a warehouse with plenty of aged round tables packed tightly together, round chairs thrown under them (most of which are broken), but the restaurant still manages to be packed with people on an ordinary weekday night so the food must be something! For the broth, we order everyone’s favourite- the pork bone broth, which also happens to be the most expensive one on the menu- and at ~$200 HKD (~$25AUD), it is easily the most expensive pork bone broth we’ve ever ordered. It doesn’t take us long to figure out why…. It’s the biggest pork bone broth we’ve ever seen! We toss aside the mountain of super fresh veggies to have later, going straight for the pork bone. There’s plenty to share, and as we suckle on them, everyone agrees they are amazingly good, although leaving so full we’re not quite sure how we’re going to stomach the rest of the food. But we do surprise ourselves and easily make our way through the dishes of incredibly fresh seafood, meat, veggies and whatever else we ordered. Prawns are served live and skewered (which must be painful!) and I can’t really stand to put them straight into boiling water, though they do taste really fresh. Abalone is also live and quite interesting, especially for someone who’s never seen live abalone before (me), as they like to swivel around their shell every once in a while when it gets warm. Thin beef slices are interestingly served frozen in an interesting array of rolls, which make it seem like a lot more than there is. Clockwise from top right: sea cucumber, sea cucumber (different part of it), fish, ? The wide range of seafood on offer never ceases to amaze me, and I can never seem to remember which seafood is which. Woops? We’ve walked past this Shanghainese restaurant a countless number of times on our last few trips to Hong Kong. Which is not surprising since it does lie across the road from the our most frequented bus stop! We finally decided to give it a try when we decided we were in the mood for some Shanghai food one afternoon, and walked in to find it quite full, not only for an early afternoon, but also for a restaurant with no lunch specials menu! The menu is a bit on the pricey side, especially the xiao long bao were around $40HKD (~$5AUD) for a serving of four, but it was worth it- afterall, they are the reason this restaurant is amongst the highlights of my trip! The xiao long bao skin is incredibly thin, and is pleated beautifully around a very generous serving of pork filling. But it’s the amount of soup in within the dumpling which makes this one unique- it’s definitely the most soup I’ve ever seen inside any xiao long bao! Perhaps a bit too much soup for some people, like my parents, who thought it felt more like the soup was injected in rather than naturally coming out through the process of steaming. The stir fries are done quite well, with plenty of ‘wok hei’ or breath of wok. Though I’m not a huge fan of Shanghai noodles, the eels were deliciously moreish and we have not trouble finishing the whole thing, sauce and all! The highlight of the meal for me is definitely the spicy ‘saliva’ chicken- beautiful tender chicken pieces bathed in a spicy red chilli sauce. Although I don’t usually can’t take chilli well, this version was not eye-watering hot (despite its appearance), but much more subtle- leaving the light tingling feeling you get with hot food, without the spiciness. It was quite an amazing feeling actually, one which I still have not found elsewhere!